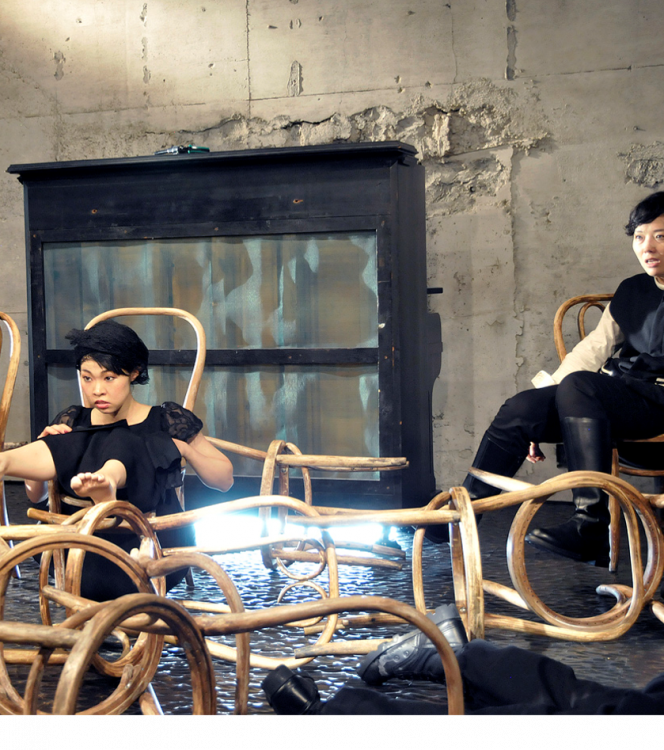 Scene from Brechtseller staged by Japanese theatre group CHITEN. Chiten’s Brecht-productions are among the most exciting appropiations of Brecht’s texts in contemporary theatre. They focus on Brecht’s idea of a „separation of the elements“ as well as the tradition of Japanese puppet theatre, „Bunraku“. Outstanding is the handling of the voice: The voices in the theater of Motoi Miura and Chiten are physical, material and stirring. They are foreign voices. Their strangeness rises from the empty space between the elements of language, gesture and movement. It rises from an art of interspace. With the new production of The Africaine by Giacomo Meyerbeer, the Opera Halle devotes itself to his last masterpiece which premiered posthumously; all as part of the cooperation project I like Africa and Africa likes me – I like Europe and Europe likes me with the Oper Lübeck and the Fonds Doppelpass of the German Federal Cultural Foundation. 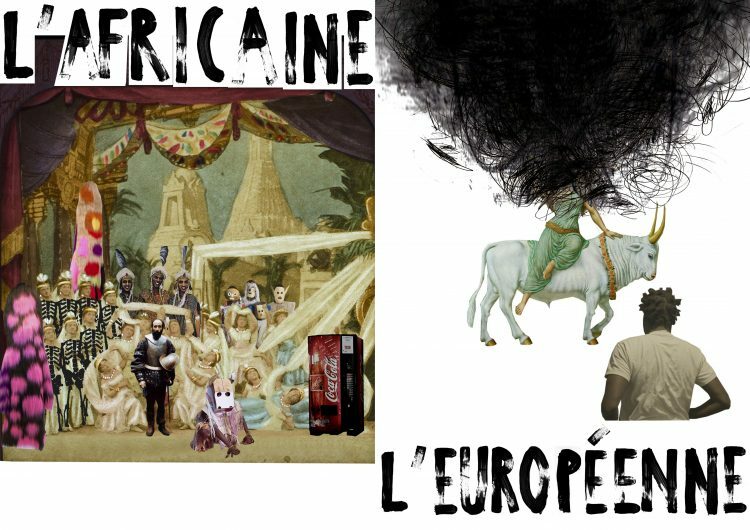 The European-African production team around Thomas Goerge, Lionel Somé, and Daniel Angermayr will be responsible for the “European” Africaine undergoing a scenic-musical process of overpainting in four independent versions in the new open-space stage Raumbühne BABYLON starting September 2018. Starting with a first enactment of the Africaine in September 2018 which cites historical ones from the 19th century, new versions and updates are created for every new block of the Raumbühne in January and March 2019 ending with an “Africanized” Africaine in June 2019. Belgian performance artist Diederik Peeters dusts off mankind‘s age-old desire for immortality. In “Erscheinungen”, he takes another shot at finally and irrefutably proving the existence of ghosts. Navigating between history and science fiction, between skepticism and confidence, Peeters sets out on a ghost hunt that will lead him through dark and damp tunnels. Science blends with magic, technology with horror. And if he manages to complete his training as a medium in time, he promises to raise some historical characters from the dead and to send them on an expedition together with the audience. 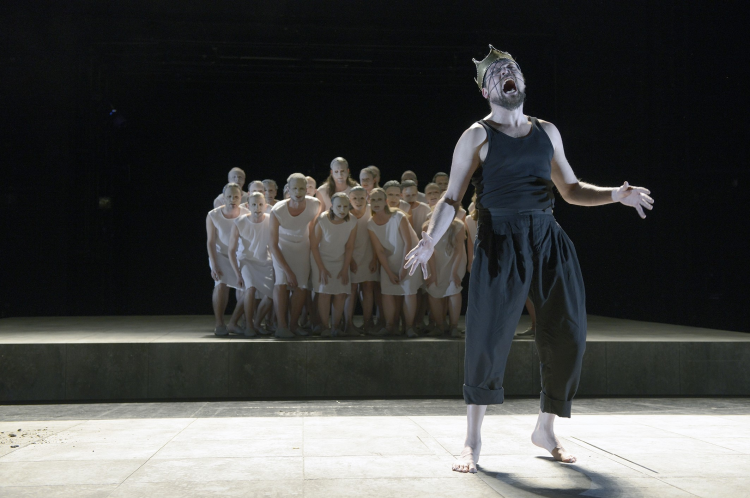 Scene from Erscheinungen staged by Belgian performance artist Diederik Peeters. Scenes from Die Maßnahme / Die Perser, 2017. A double exploration of two cornerstones of theatre history, both of them created during and shaped by extreme times. 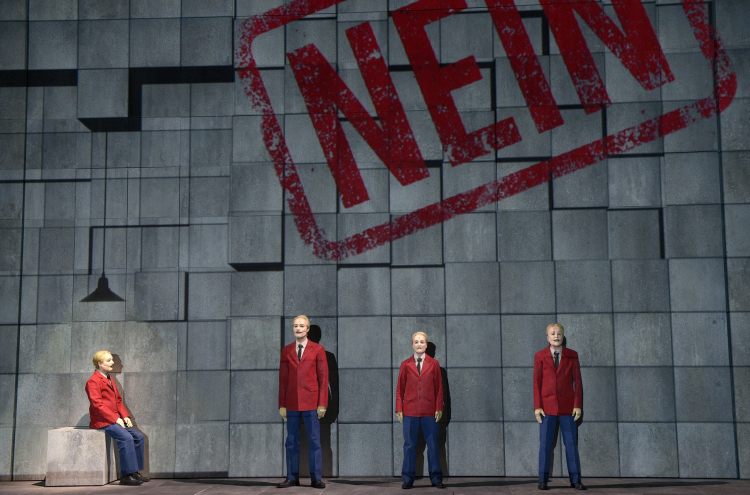 Two plays specific to their eras and two teaching plays, each in in its own particular way: Die Perser (The Persians), the oldest remaining drama of humankind and one of the few ancient tragedies that dealt with real events – and Die Maßnahme, the renowned co-operation between Bertolt Brecht and Hanns Eisler which served as a model for Brecht’s theory of “Lehrstücke” (teaching plays). Their common ground lies in the topics of hubris and delusion. But between conflicting priorities of humanism and ideology, the weight of an idea and the value of an individual, they each develop quite a different way of examining the effects of political ideas and the awareness of individual suffering. SAT, 22.06.2019, from 8:00 p.m.
A particularly special event awaits you on the congresses last evening. The festive Gala Dinner offers an opportunity to let yourself be indulged by a four-course menu and an artistic programme. In addition to Caribbean-Asian delicacies, you can expect an exciting artistic programme: Theatre educator and stage speaker Hans-Martin Ritter will accompany the evening with musical poems by Brecht in the course of his reading STÄDTEBEWOHNER. In addition, friendly fire — a free theatre and performance group from Leipzig — will present their newest artistic installation AMONG US / UNTER UNS: INITIALS BB. Enjoy with us an exciting and culinarian evening that by music and performances until late night provides a befitting finale to our symposium! SAT, 22.06.2019, 8:00 p.m.—1:00 a.m.